27 March - 31 October. 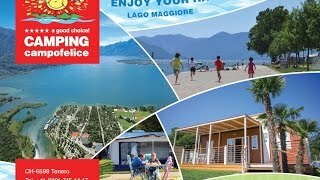 Considered by many to be the best family campsite in Switzerland, Campofelice is bordered on the front by Lake Maggiore and on one side by the Verzasca estuary, where the site has its own marina. It is divided into rows, with 610 generously sized touring pitches on flat grass on either side of hard access roads. Mostly well shaded, all pitches have electricity connections (10-13A, 360 Europlug) and 410 also have water, drainage and TV connections. Pitches near the lake cost more (these are not available for motorhomes until September). A special area is reserved for small tents. A little more expensive than other sites in the area, but excellent value for the range and quality of the facilities. 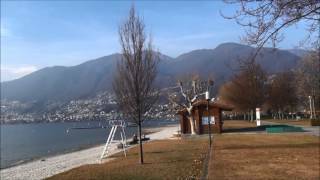 Sporting facilities are good and there are cycle paths in the area, including into Locarno. A free shuttle bus runs to Locarno ferry terminal. The beach by the lake is sandy, long and wider than the usual lakeside ones, and has now been extended, with well kept lawns for sunbathing. It shelves gently so that bathing is safe for children. Within a demarcated area are floating trampolines and rafts, and a specially marked section for toddlers. A slipway may be used for small boats and dinghies, with canoe and pedalo hire on site. A giant marquee caters for entertainments of all kinds and is used as a playground in wet weather. Modern heated sanitary facilities of exemplary quality. Washing machines. Dryers. Pool. Wellness Area. Boat harbour. Aquapark. Charging station for electric cars. Two playgrounds. Tennis. Minigolf. Bike track. Beach-volleyball, Bicycle hire. Canoe. SUP. Pedalo hire. Car hire. Car wash. Free WiFi. Soccer field. Pizzeria-restaurant. Take away. Bar. Snack-bar. Various shops. Lifeguards. LEDWall Pavillon. Doctor calls. Dogs not accepted. Entertainment program with shows, games and sport competitions. Snack kiosk at beach (400m) Motorhome services. Gas supplies. 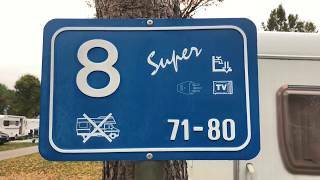 On the Bellinzona-Locarno road 13, exit Tenero. Site is signed at Co-op roundabout. Coming from the south, enter Tenero and follow signs to site.